Kato Reis, 97, plays a song on the piano in her independent living apartment’s lobby on May 26. Reis, who was classically trained when she was younger, has a large repertoire of songs that she has completely memorized and plays without sheet music. Photo by Veronica Weber. Seated at the piano, 97-year-old Kato Reis fills the soaring lobby of Vi at Palo Alto retirement community with Chopin. It's an ordinary Tuesday afternoon, just after lunch. Passers-by have stopped to listen. Reis's sure and powerful hands fly over the keys, and she hardly misses a note as she plays expressively -- from memory -- seven or eight compositions by Chopin, Brahms and Mozart. "I don't play music every day, but it seems the older I get, the more I want to play," says the Hungarian-born concert pianist and 60-year resident of Atherton, who moved to the Vi a decade ago. "I have aged but, strangely, my fingers have not. They seem to be very agile. I wouldn't say that about the rest of me." Though she's lived in the area for 70 years, since her 1946 wedding at Stanford Memorial Church to businessman Robert Reis, Kato Szekely had been raised in Budapest as something of a child prodigy. An only child strictly supervised by her mother, she practiced piano for hours a day from a young age, earning entrance to the prestigious Franz Liszt Academy of Music by the time she was 8. "My mother was very talented in music, and she could have become an excellent pianist, except she got married at 17 and had me at 18," Reis said. "So she decided to make me into what she didn't become. My mother went to my piano lessons, listened to what the teacher said and made sure that I did what the teacher wanted. "Nobody cared how I felt about it. I did what my mother wanted me to do, and that was that. But the minute she left to answer the phone, I would quit. I was a normal kid. No kid in her right mind wants to work as hard as I did. But I didn't know I worked hard -- I thought it was part of life." Parents are mistaken if they think their children will master an instrument simply because they've hired a teacher, Reis said. "The teacher is only a little bit of what it takes -- the rest is up to the mother." With her days taken up by intensive training at the music academy, Reis had to study traditional academic subjects with a home tutor. She was tested in written state exams at the end of each year in courses that included Latin, German, French and English. Upon her graduation from the music academy in 1938 -- at the urging of an uncle who had migrated to California -- Reis and her parents moved to Los Angeles to further her career. "I spoke fluent English but my parents did not," she recalled. "I taught anybody who wanted to have a piano lesson. My father, who had run a bank with his brother in Budapest, didn't want me to be the only one who was supporting the family so he took a job with the Langendorf bakery." Reis's first paying student was her mailman, who would stand by her family's apartment door and listen to her play. As her teaching roster grew, she also began playing for schools, civic organizations, musical groups and private parties, typically for $20 to $25 a performance. Reis still has a ledger created by her mother in 1938, listing the program of each performance along with what she wore. A separate scrapbook preserves her many press clippings from the Los Angeles Times and the Pasadena Star-News. Around that time, Reis acquired an agent and also began using the surname of her famous great-great grandfather, the composer Felix Mendelssohn. 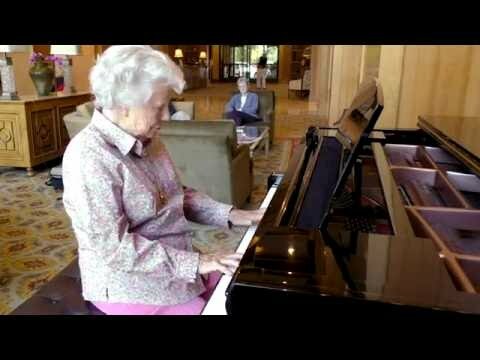 She played in concert halls and for U.S. troops in World War II. When her playing caught the attention of well-known actor Edward Everett Horton, movie stars began asking her to teach their children. In her mid-20s, Reis left behind her concert career to marry and move to Northern California. She continued teaching piano while raising four sons -- all of whom she required to study piano plus one other instrument -- but eventually stopped. She took up bridge, tennis and golf and volunteered at Allied Arts, Meals on Wheels, Family Services and the San Francisco Symphony League. Reis and her husband were among the first to move into the Vi when it opened in 2005. Robert Reis died three years later, at 91. In addition to her four sons, who all live in the area, Reis has 10 grandchildren and eight great-grandchildren. Lately, Reis said, she's increasingly drawn back to the piano, though she is humble about her talent. Many others at the Vi also have led interesting and accomplished lives, she noted. Does music keep her young? She seemed puzzled by the question. "I don't know that music keeps me young. The good Lord keeps me young," she said, adding that her family, friends and bridge-playing also help. Reis said she hasn't looked at written music in decades. Her memorized repertoire, once about 150 compositions, is "now down to maybe around 50," she said. "I've been playing more often now than in the years past," she said. "I think I only do it because time is running out. Maybe I won't wake up tomorrow, so I'd better play today."